Since yesterday’s post contributed to my best day ever of site views and is currently the second most viewed post I’ve written and has the most comments of any single post, I wanted today’s post to be kinda sorta almost related. So we get to talk about rereading books! I mentioned in the comments of yesterday’s post and in previous posts on here that I’ve never once reread any book, except for my own. Why? Because there are so many books that I’ll want to read in my lifetime that I don’t want to keep reading a book or a few books over and over again. I mean, I just don’t understand the reasoning behind reading a book that you already know. Sure, maybe you haven’t picked it up in a few months or even years, but once you start reading you realize how well you already know the story. That is no longer entertainment, it’s boring. Are there books on my shelves that I’d like to reread? Of course. Are there books on my shelves that I read so long ago that I have no idea what they’re even about? Yes. But will I be going back through my own little library any time soon to reread either of those types of books? Nope. I know I’m going to be in the minority a second day in a row, but that’s okay. Tell me why you reread books. 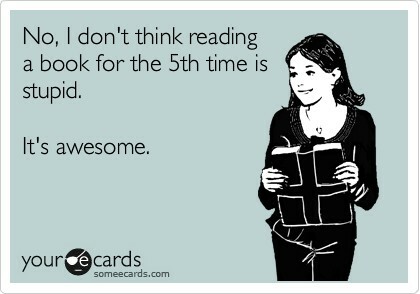 And don’t you dare just say that there are some books that are so great that you have to reread them. We’ve all read great books. If that’s your reasoning, get away from me.